The new Mojo 3 brings 2.8” plus tire capability to this popular trail bike (click to enlarge). Perhaps the latest in a seemingly never-ending procession of mountain bike innovations to make bikes more capable and riding experiences more comfortable is the plus-size trail bike. Scott has one. Santa Cruz has one. And Specialized, too. Now add Ibis to the club with its just released Mojo 3. Video: Jeff Kendall-Weed puts the Mojo 3 through its paces. Video provided by Kitsbow. Why Mojo 3? Well, the first Mojo was a steel hardtail introduced in the early ’90s. The Mojo 2 was a long-travel, full-carbon fiber bike that came out in 2005. And now, the Mojo 3. Depending on how you look at it, the redesigned Mojo 3 could be the baby brother to the HD3 or the successor of the Mojo SLR, but with one main difference – the Mojo 3 has been designed around the capability to run 27.5×2.8” tires. There are a number of complete build kit options starting with the Special Blend at $3,999. Frame only is $2,999. At first glance, the Mojo 3 looks almost identical to the HD3, but underneath the bright gloss red finish, the Mojo 3 boasts some significant weight savings, shaving nearly a pound of frame weight as compared to the HD3, coming in at a trim 5.45 pounds in size medium with a Fox FLOAT DPS EVOL shock. 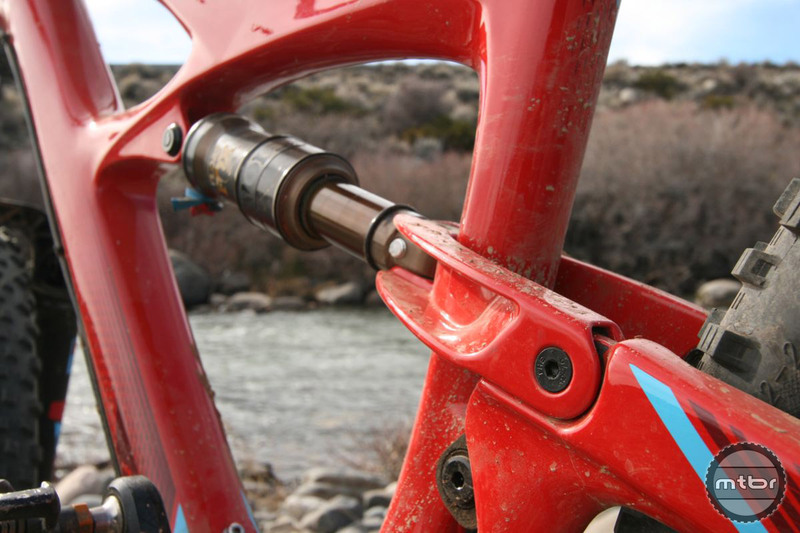 The reason behind this weight savings is the shorter 130mm travel that allows for a lighter composite layup design without sacrificing any stiffness says Ibis, which claims the rear swingarm on the Mojo 3 is slightly stiffer than the HD3. Fox FLOAT DPS EVOL make a sharp and capable combination.” width=”1200″ height=”800″ class=”size-full wp-image-141553″ /> An updated dw-link suspension and the Fox FLOAT DPS EVOL make a sharp and capable combination (click to enlarge). In addition to its lighter weight, the Mojo 3 features dw-link version 5 design. Ibis trail bikes have always been adept climbers, and the Mojo 3 promises to continue this trend of efficient performance when the trail points uphill. When the trail points downhill, the Mojo 3 delivers a long, low and slack feel thanks to a 66.8-degree head tube angle with a 140mm RockShox Pike fork. Balancing out the slackness up front are short 425mm chainstays, giving the bike balance between high-speed stability in the steeps with quick, sharp performance in tight switchbacks. Designed around a Boost rear axle, the Mojo 3 offers clearance for 2.8” wide tires, such as Schwalbe Nobby Nic 27.5×2.8” (click to enlarge). In order to clear 27.5×2.8” tires, the Mojo 3 features Boost 148mm rear and 110mm front axle spacing, with contoured notches in the rear swingarm to further clear the plus size tires. Schwalbe Nobby Nic 27.5×2.8” tires clear the frame with just barely enough space, but I would be a little concerned what clearance would be reduced to in muddy conditions. In situations like that, slightly narrower 2.4 tires would offer better traction in mud anyway, while offering more than adequate tire clearance. 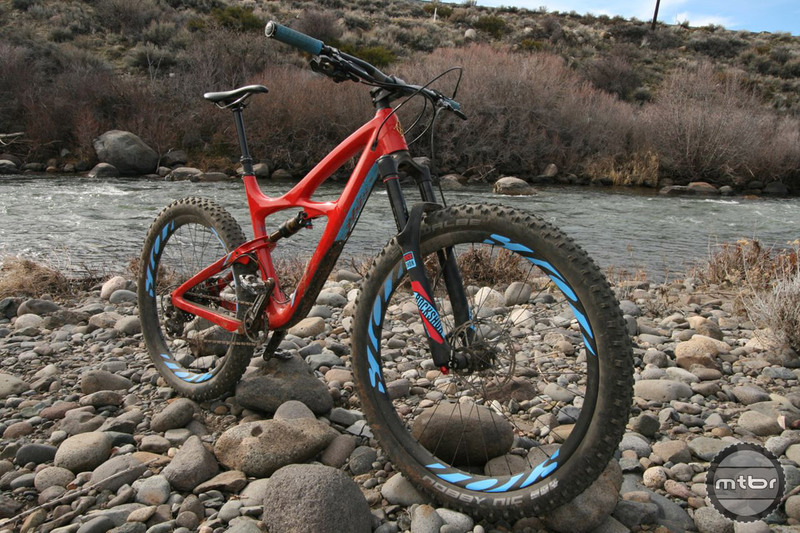 Ibis also made sure that the Mojo 3 didn’t compromise geometry spec, so unlike the recently released Santa Cruz Hightower, the Mojo 3 cannot interchange 27.5+ and 29” wheels. If the Mojo 3 had been designed to accommodate 29” wheels, running the 27.5×2.8” tires would have lowered the frame’s 13.1-inch bottom bracket height a half-inch, creating pedal strike issues. And regardless of plus size or a narrower 2.3” tire, bottom bracket height at sag is the same. You can email demoanibis(at)gmail(dot)com for factory demo, Shredchic! They’d have my $$ if it fit 4″ tires…. Looks great. Have mentally turned a corner from “more travel is better” and think a 140ish 27.5+ would be a great option when I tire of my 160ish 27. Love the DW, glad to see an affordable plus bike with it. Okay, crazy idea here, but bear with me for a second. Take your 2.5″ Minion WTs, put them on some wide rims (say, WTB i35s or Derbys), then…. add Procore. And drop the pressure to 15 psi. Now you have a tire system that has the same contact patch as your plus size abominations (because its at the same pressure), but a more stable sidewall, cornering nobs meant for speed, and the protection and suspension bonuses of Procore. All for minimal to nonexistant weight penalty. And much better wild riding capability. Can we please pause from this plus size “ZOMG TRACTION! STABILITY!” hype designed to sell us new bikes and realize existing systems can give us the same capability with our existing frames? Why is no one reviewing this? I have no real knowledge on this… But I’d think a procore inside a really wide rim will limit it’s ability to protect the rim because it has room/width to deform inside and allow rim sidewall contact? Especially off angle cornering/ “wild riding”. I’d think that without the extra volume of a plus size tire, (which also means sidewall height), that you wouldn’t be able to “match” the low pressure and contact patch of a plus size tire? At any rate, it’s a good idea! If it worked without rim damage you’d get you closer to the contact and low volume of plus without having to take the disadvantages of poor tire selection and the “uncertain” feeling of Plus size tires. Someone needs to try this ASAP! I think Procore will do just fine with a 35mm rim. You need a minimum of 23mm to be able to mount it, and it seems like Schwalbe developed it with those W30, W35, and W40 MX Syntace rims in mind, which get pretty wide (procore was a joint project between Schwalbe and Syntace). As far as volume and pressure goes, there is no inherent advantage to a plus size tire for pressure. They’re just made for wide rims and lower pressures. Sheldon Brown has a great write-up on it, but contrary to what everyone believes your tire pressure doesn’t actually change much, if at all, when it’s taking hits (when people talk about this happening in cars, this is due to the tires heating up, not running over bumps). Accordingly, the extra volume of a plus size tire doesn’t add anything. The only real advantage I can see with plus size tires at the moment is that they’re meant to be run on wide rims, and you don’t get messed up tread patterns like you do with normal tires. Really hoping the WT casings (and whatever other companies call their versions) change this for normal tires.